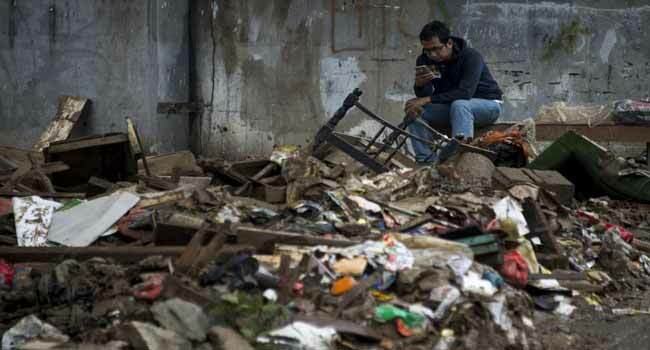 A man uses his mobile phone while sitting surrounded by garbage which was carried left by recent flooding in Jakarta on February 8, 2018. The Jakarta Disaster Management Agency (BNPB) has issued a flood alert alert after heavy rains in Bogor, West Java, over the weekend, which flooded hundreds of homes along the Ciliwung river in Jakarta. Thanks to a fast-growing secondhand market, smartphones are increasingly being re-used but large-scale handset recycling is not happening as the industry struggles to go green. Thrown in the thrash or left abandoned in a drawer, the fate of mobile phones — which consumers replace on average every two years — is starting to change amid growing criticism over their environmental impact. “People love technology — the upgrades, the unboxing, the new features,” the EEB network of environmental groups in Europe said in a statement as the world’s largest mobile phone fair opened this week in Barcelona. “There is very strong growth in the reused phone market,” said Bertrand Grau, a technology analyst at Deloitte, which forecasts sales of second hand mobile phones will expand by 20 percent a year between 2015 and 2020. The surge in sales of secondhand phones — which may just need a change of battery or screen — is being fuelled in part by consumers, who are reluctant to dish out more money for new models that offer little innovation. As such, mobile brands and operators are increasingly offering phone exchange programmes. Consumers can turn in their old model to get a discount on a new one or cash. “Today this has become almost a mainstream practice around the world,” said Biju Nair, the head of Hyla, a Texas-based firm which helps the industry collect and repurpose used phones and had a stand at Barcelona’s Mobile World Congress. Hyla and other such firms provide operators with software that checks the state of the phone, makes sure it was not stolen, erases all the data on the device and makes it reusable. “We realised that smartphones that had significant market value were not recycled, even though there was an interest for consumers to do so,” said Volpy head Marc Simeoni. The system is still in its infancy. Only 7 to 15 percent of smartphones sold in France, and 20 to 25 percent of those sold in North America, are reconditioned. But “it’s a first step to responsibly handling phones,” said Elizabeth Jardim, an e-waste specialist with the US branch of Greenpeace. “We advise to keep the phones in use for longer, whether it is the original owner, or whether it’s a second-hand owner” since this reduces the amount of energy and raw materials used to make a new one, she added. A smartphone is made up of about 50 different materials, including rare materials that are sometimes extracted from nations in conflict like the Democratic Republic of Congo. Manufacturing smartphones also requires a huge amount of energy, often fossil fuels since 60 percent of them are made in China where coal remains the main source of energy. And only about 20 percent of all e-waste — defined as anything with a plug or a battery — is going in the official collection and recycling schemes, according to a UN report. “One thing that makes it difficult is the way the phones are designed. They’re incredibly fragile, for instance the glass they use for the display. Often, the phones are designed to be difficult to be repaired,” said Jardim. Faced with these problems, efforts by major brands remain slim. Technology giant Apple said last year it wants to “one day” end the need to mine materials from the earth to make its gadgets. It has melted down iPhone aluminium enclosures to make mini computers used in its factories. And under pressure from Greenpeace, Samsung agreed to recycle the Galaxy Note 7 smartphones it was forced to recall in 2016 because of problems with its battery.